Armoured concrete lends itself particularly to the construction of beams which are continuous over their supports and of beams with fixed ends. As pointed out in Volume IV., the fixing of ends cannot be entirely relied upon, and it is usual to consider the bending moment at the centre of such beams as wl2/10. while the BM at the supports should be taken as not less than wl2/20. In the case of continuous beams carrying a live load, one bay alone may be fully loaded, when the BM at the centre of this beam will be greater than that given in Chapter IV (Ecclesiastical Buildings). Part II. Volume IV., and it may well be assumed that the BM at the centre of each span iswl2/12When, however, a dead load only is carried the BM shown in Fig. 70, Volume IV., may be considered as appertaining; but for sake of uniformity it will seldom be advisable to alter the section of the beam in accordance with these variations in BM, nor the section of the pillars to the varying reactions. At the outset it will be assumed that the resistance of the concrete to tension is negligible. As a general rule, however, it is probable that the concrete aids in the tensile resistance to an appreciable extent, and it is maintained by some authorities that it offers resistance right up to the breaking-point of the beam, even when strained far beyond the point at which it would naturally break, this property being produced by the reinforcement, which prevents excessive elongation at one particular point and spreads the effect of strain throughout the length of the beam. It is common knowledge that concrete when setting and hardening in air will contract, and if prevented in this it will crack. This is largely overcome in armoured concrete by the distributing action of the reinforcements just mentioned; but, considered generally, the tensile resistance cannot be relied upon, while, by neglecting it, the safety of the beams will be increased. 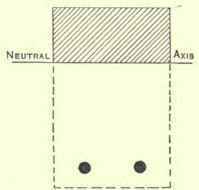 Thus in the considerations of the longitudinal stresses in beams the concrete on the tensile side of the neutral axis may be regarded as non-existent, as shown in Fig. 49. In the consideration of beams (Chapter II (Setting-Out). Part II. Vol. IV.) it was assumed that on the beam being deflected the extension and compression would be as illustrated in an exaggerated form in Figs. 49 and 62 in the same Volume, the section plane before bending remaining a plane surface after bending. On this assumption strain is proportional to the distance from the neutral axis; and, as it was shown in that case that stress was proportional to strain, intensity of stress also varies directly as the distance from the neutral axis. The assumption that a plane section remains a plane section after bending will be again assumed here, although its absolute truth is more than doubtful; for even in the case of a homogeneous material the shearing stress between layers will produce a wavy surface, while the shearing stress between reinforcement and concrete produces a hollow in the originally plane surface. The result of deformation probably takes somewhat the form shown in Fig. 50. However, the assumption may be most conveniently adopted, and is sufficiently accurate, while the result will be on the side of safety. When considering steel, stress was shown to be proportional to strain, with the result that intensity of stress increases evenly from zero at the neutral axis to its maximum at the extreme fibre. In the case of concrete this law of proportion does not hold, the stress becoming less in proportion to the strain as the latter increases; that is to say, the modulus of elasticity decreases as the stress increases. Fig. 51 shows the approximate form of the stress strain curve. Thus in the case of a rectangular beam, as the strain increases regularly from neutral axis to outer fibre, the area representing total compressional stress (Fig. 52) is bounded by the same curve as that in Fig. 51. This curve is found to follow very closely the parabolic form for the range of stress applicable in practice. Many prefer to consider the stress as being directly proportional to the distance from neutral axis, as in the consideration of steel (Fig. 53); but the parabolic form is certainly nearer the truth, while its application introduces no greater complication; for the area contained by a parabola = 2/3 bh, while the height of its centre of gravity above the neutral axis = 3/5h. It is even probable that the curve bounding the stresses actually produced will take a still more curved form, on account of the shear stresses producing a distribution of strain, as already pointed out in reference to Fig. 50. The actual strength of a rectangular beam as found by experiment is considerably greater than that found by theory, and this is probably due in part to the assumption that a plane section remains a plane surface after bending has occurred, and in part to the continuous support and resistance to lateral swelling or contraction afforded between layer and layer. In armoured concrete the latter effect will be increased by the use of stirrups, and is the basis of the results achieved by M. Considere's hooped concrete (see page 41). It is usual to meet these uncertain quantities by increasing the safe limiting stress, which may safely be raised to 500 lbs. per square inch, a figure which is commonly used; but it must not be forgotten that this value may only be used in the consideration of resistance to bending. The safe stress upon the compressional side of the beam thus becomes 2/3 bh x 500 lbs.